Well its official! 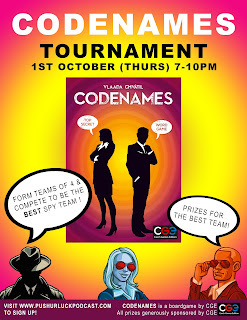 I will be organizing a CODENAMES tournament for NYU Game Center students on 1st October 2015, thursday, 7-10 pm (after playtest thursday). Form teams of 4 members each and sign up here http://goo.gl/forms/6eIFvgtrrW by end of September! The tournament is free to enter and the winning team members will stand to win 1 copy of CODENAMES each! Much thanks to Czech Games Edition for sponsoring the prizes! The game is easy to learn and play so even if you want to sign up by yourself and form a team then, please feel free to do so!